Siemens' Vectron locomotive was officially introduced at Innotrans 2010 Berlin. Image courtesy of Siemens. Vectron is equipped with the energy storage module Sitras ESM for mobile and stationary applications. Image courtesy of Siemens. Railpool of Germany received its first of six Vectron locomotives ordered in November 2012. Image courtesy of Siemens. Vectron DC locomotive is operational in Poland. Image courtesy of Siemens. Vectron is the first locomotive design to meet the European Technical Specification for Interoperability (TSI), relating to the operation of rolling stock on the trans-European high-speed network (HS RST). Image courtesy of Siemens. Vectron is the latest class of locomotives offered by Siemens. Vectron is claimed to be the first product of its kind in the European locomotive market, with flexibility to adapt to different route requirements and modular features. The new class of locomotive made its debut in the international Trade Fair Innotrans 2010, held in Berlin, and has received a significant response from the European rail industry. In 2012, Vectron was certified as the first locomotive design to meet the European Technical Specification for Interoperability (TSI) requirements pertaining to the operation of rolling stock on the trans-European high-speed network (HS RST). As of January 2013, Vectron was already approved for operation in Sweden, Romania, Poland and Germany. DB Schenker Rail Polska of Poland and Railpool of Germany had received their first Vectron locomotives by that time, while certification runs of Vectron were also ongoing for Switzerland, Italy and the Netherlands. "As of January 2013, Vectron was already approved for operation in Sweden, Romania, Poland and Germany." The Vectron locomotive has been designed to meet the different traction needs of its customers. It is available in broadly four versions, including alternating current voltage system (AC), direct current voltage system (DC), multivoltage system (MS) and diesel-electric (DE). The MS and AC versions of the locomotive are available in medium and high-performance variants, with the maximum power output ranging from 5.6MW to 6.4MW. The DC versions are available only in the medium power variant, with the maximum power output of 5.2MW. The engine of Vectron-DE is rated to range from two megawatts to 2.4MW. Vectron represents innovation and combination of proven technologies from Siemens’ previous locomotive platforms – Eurosprinter and Eurorunner. "The new class of locomotive made its debut in the international Trade Fair Innotrans 2010, held in Berlin." The bogie design of all Vectron configurations is based on the ‘Ritzhohlwelle’ concept, which was used for the EuroRunner models. The wheel brake disks and a standard pivot solution have been incorporated from the Eurosprinter ES64F4. The pinion hollow-shaft drive system has been adopted from the latest EuroRunner model. Vectron is equipped with the energy storage module Sitras ESM, both for mobile and stationary applications. The ESM facilitates flexible applications, such as energy saving through regenerative braking and voltage stabilisation. Vectron has a crash absorbing frontend, which is replaceable after an accident. The engine room of Vectron has a wide straight gangway that provides an escape route for the driver in an emergency situation. The driver’s cab is modular in design. Vectron has back facing cameras, instead of cab side windows and mirrors. The train protection and communication equipments of the Vectron are of modular design. The locomotive is compatible with the train protection systems used in Europe. Vectron also features the integration of GSM/R and analog train radio. The length, width and height of Vectron locomotive are 18.98m, 3.01m and 4.24m respectively. It has a Bo’Bo’ wheel arrangement and the wheel diameters are 1.25m (new) and 1.17m (worn). The maximum axle load of the Vectron is 22.5t. The starting tractive effort for the locomotive is 300kN. "Vectron represents innovation and combination of proven technologies from Siemens’ previous locomotive platforms." In addition to highly-efficient regenerative braking, Vectron features low-energy shutdown and optimised system design to minimise energy consumption. The locomotive can be used for both cross border fast passenger and freight services. Vectron is an ERTMS compatible locomotive designed to be interoperable across European rail networks. A successful test of the Vectron locomotive was conducted by Eurotunnel and Siemens in the Channel Tunnel in January 2013. The Channel Tunnel is a 50.5km undersea rail tunnel, linking the United Kingdom with northern France. The electric Vectron locomotives can be operated at a maximum speed of 200kmph. The maximum speed of the Vectron DE locomotive is 160kmph. The Vectron DE locomotive engine is equipped with particulate filter that reduces emissions by up to 87.5%. The locomotive has also been proven to be five to ten percent more efficient than diesel-hydraulic locomotives. Siemens had received an order at the end of 2010 to supply six Vectron locomotives to Railpool of Germany. Railpool received its first Vectron locomotive in November 2012. In the beginning of December 2012, DB Schenker Rail Polska of Poland placed an order for 23 Vectron DC locomotives. It received two locomotives at the end of December 2012. The remaining deliveries will be made by 2015. 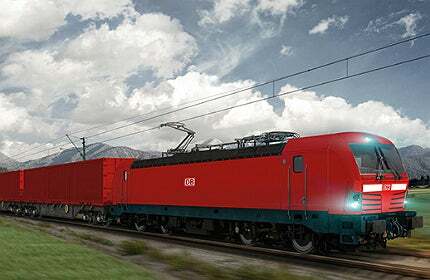 DB Schenker Rail Polska is planning to order 13 more Vectron locomotives. The locomotives will be manufactured at Siemens’ Munich plant. Siemens ICx is a next generation high-speed train, designed for the German national railway company, Deutsche Bahn. Velaro is the world’s fastest high-speed train, developed by Germany-based company Siemens.